e.l.f. has mineral makeup! Their starter kits are $20 each & range from fair to deep skin tones. 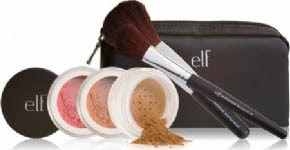 Each kit includes foundation, concealer, blush, & 2 brushes. Ooo, I'm so excited!